Life is a journey, and the more you check in with God, the more insight you'll have along the way. 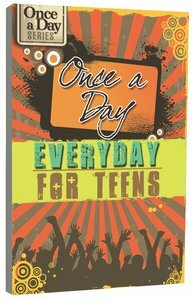 Once a Day: Every Day for Teens devotional offers you 365 readings to inspire, motivate and challenge you in your quiet time. This devotional also includes a one-year Bible reading plan, that will help you read an excerpt from the Old and New Testament each day. Get ready to jumpstart your day and your life! About "Once a Day: Everyday For Teens"